SOXX (semiconductor ETF) is backtesting the 164.58ish former support, now resistance level which might normally offer an objective short entry or re-entry from the previous short trade on the semi, in which SOXS was used as the proxy for that trade. We had a very timely exit on the recent SOXS (3x bearish/short semi ETF) trade, closing it out early when T1 was hit in the anticipation of a bounce in the semis & broad market, which allowed us to book profits right at the highs on SOXS (lows on SOXX) before the semis reversed sharply. 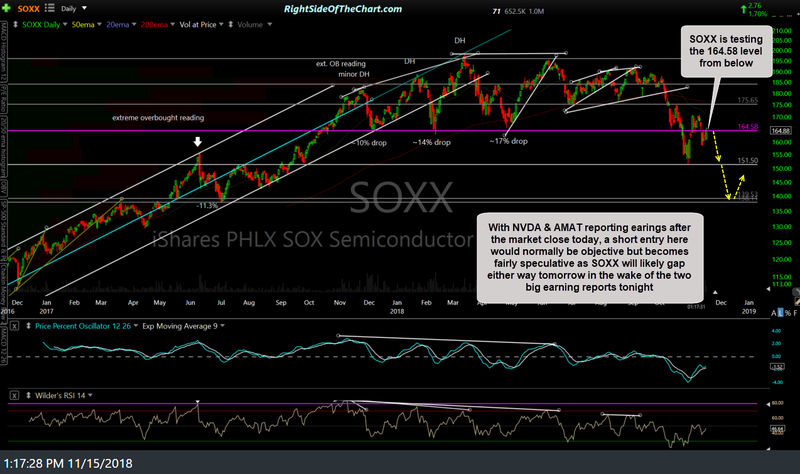 With NVDA & AMAT reporting earnings after the market close today, a short entry here would normally be objective but becomes fairly speculative as the semiconductor sector will likely gap either way tomorrow in the wake of the two big earning reports tonight. While every position taken when swing trading involves some degree of risk, establishing a position on the semiconductor sector just before two potentially sector-moving earnings reports is too much of a gamble to add SOXX or SOXS as an official trade. As such, I wanted to pass along the setup for those interested although I may also consider adding an official short trade on the semis tomorrow or Monday, depending on how the semis trade after today. Additionally, I’d like to see if & how those bullish divergences that I’ve recently highlighted on the 60-minute charts of the index futures play out over the next day or so. I have been in AMD it has performed stronger relative to the market and NVDA the last couple of days. In fact as the market was selling off yesterday it kept going higher and held pretty well. Not sure if this indicates further upside in the near term. 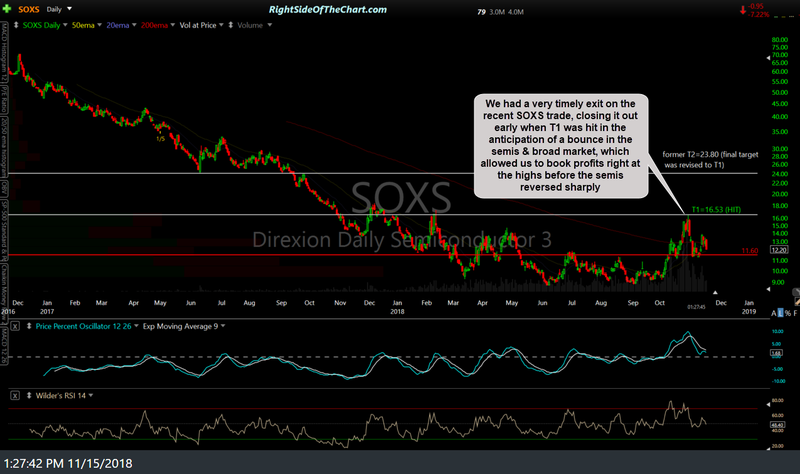 I went long on SOXS this morning. I will hold it for some time.